When I found it it was a dark reddish wood with a faux stained glass insert. It was just one of the many boring little wooden jewelry boxes that I see at thrift stores all the time. I think I paid $2.99 for it at Goodwill. Small jewelry boxes like this are super easy to work on so it was a quick project. I think it sold for either $12 or $15 at Treasure Island Flea. CeCe Caldwell’s chalk and clay paint, Thompsonville Teal – Here’s a similar paint that I’ve been using that’s MUCH cheaper! The inside was clean so I didn’t do anything but wipe it out with a damp cloth. Don’t pass up boxes if they have a stain inside though. 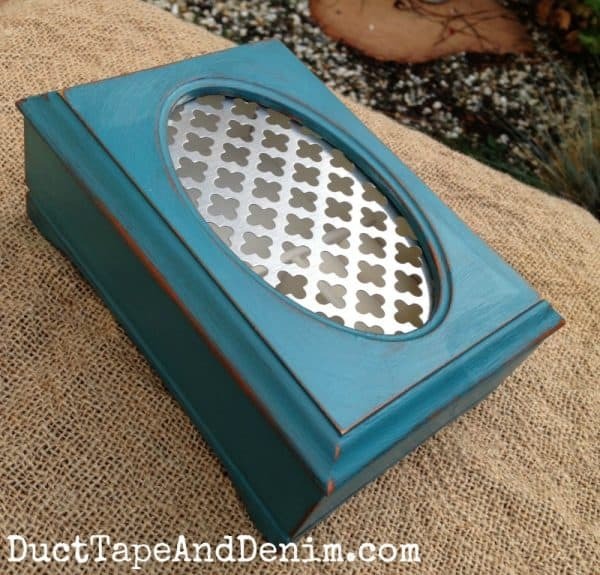 There are many ways you can also refinish the inside of a jewelry box. Check out my other jewelry box projects to see some of them. 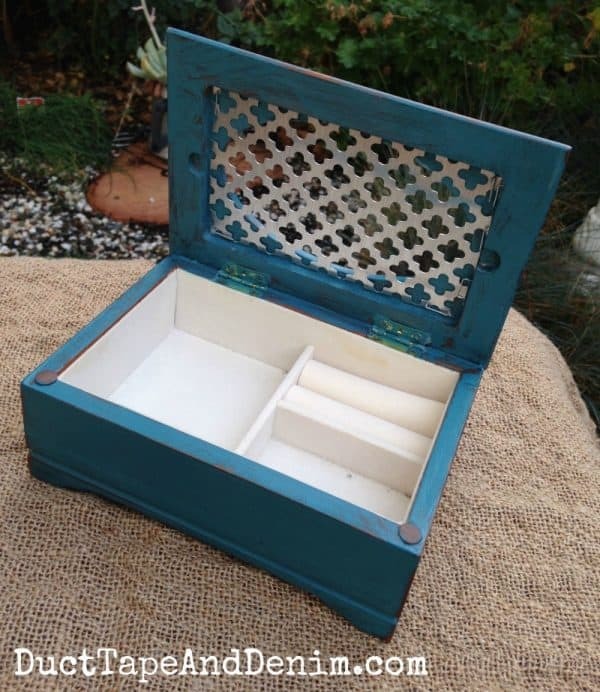 Leave a comment and let me know if you’ve ever upcycled a jewelry box! I love this jewelry box. Great update! I had no idea that this was a jewelry box until you showed us the insides. Paint really brightens it up. This is very pretty. I like the addition of using the decorative sheet metal. I think I’ve walked by several jewelry boxes with stained glass, but this update is easy that I may just buy one. Great job! You should! Send me a picture if you do. I’d love to see what you come up with!!! 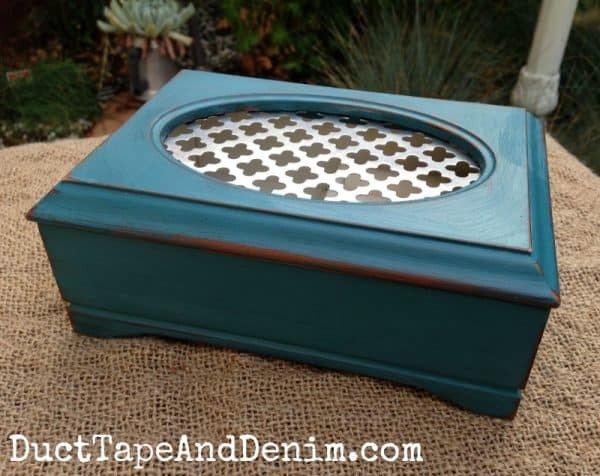 Love the color you used, great upcycle!! Thanks! Turquoise is my favorite but teal comes in close! I just bought 3 jewelry boxes at a thrift store and need ideas . Thank you for giving me ideas !! Great, Melissa! I’d love to see how they turn out! I LOVE this color! Thanks for including the link to the color choice. I’ll be hunting it down!